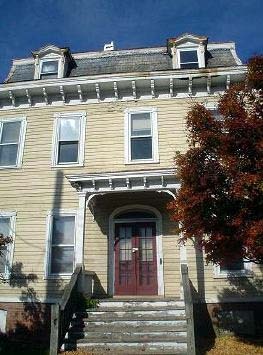 The DuBois Family House on Huguenot Street in New Paltz. 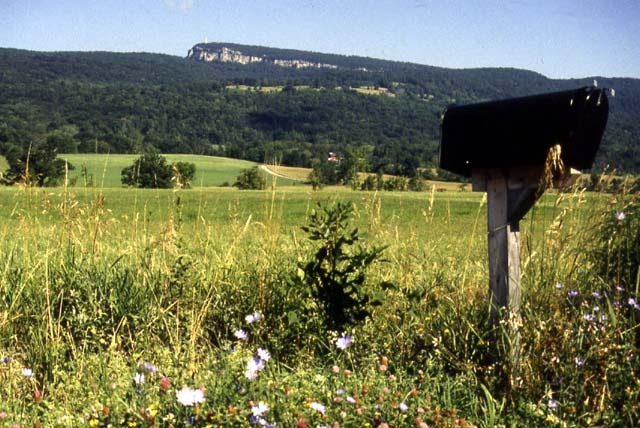 The escarpment of the Shawagunk Mountain ridge looms over the Walkill Valley. 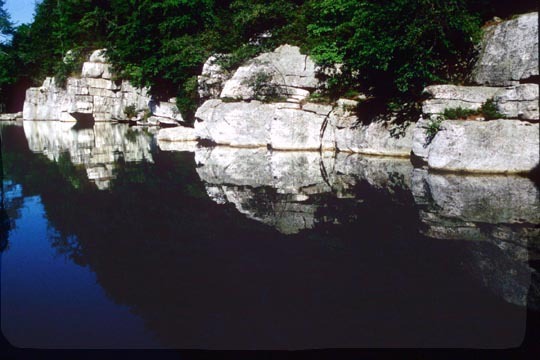 The deep blue waters of Lake Minnewaska refer the white conglomerate rocks making it a Shangri-la place of beauty and solitude. 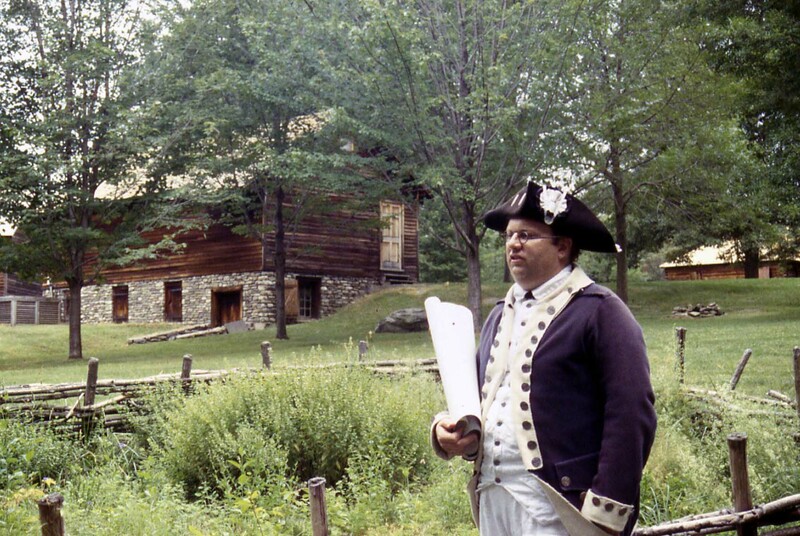 Costumed guide greets visitors to the New Windsor Cantonment (near Newburgh). The Bear Mt. Bridge cross the Hudson in a narrow section of the Highlands. 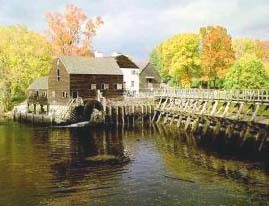 The old Dutch-English Philipsburg Manor in Sleepy Hollow is a great stop to learn about the early history of the colonial Hudson Valley. 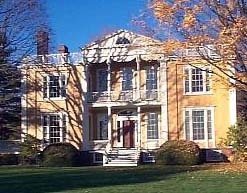 Boscobel is one of the beautful mansions of the lower Hudson Valley. It is still in the process of restoration. 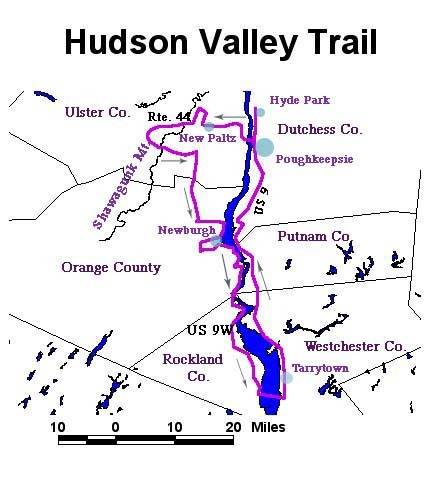 The Hudson Valley Loop follows the might "North River" in one of the most historic and scenic regions of New York State. Here you find battlefields of the American Revolution, majestic mansions from centuries past, and stunning vistas of the Hudson Highlands. Also included in this loop is a "detour" through the Shawangunk Mountains. Fasten your seat belts. It's going to be smooth ride! Come dine with Franklin and Eleanor! 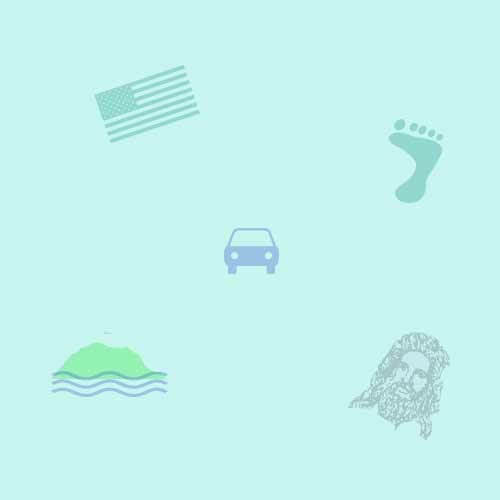 For the sake of convenience, start your road trip in Poughkeepsie, one of the largest river ports on the Hudson. Take US Route 9 north along the river to the village of Hyde Park. Here you can visit the palacial Vanderbilt Mansion and the Franklin D. Roosevelt National Historic Park, home to the greatest president of the 20th century. Backtrack south and enjoy a feast at the Culinary School, also in Hyde Park. 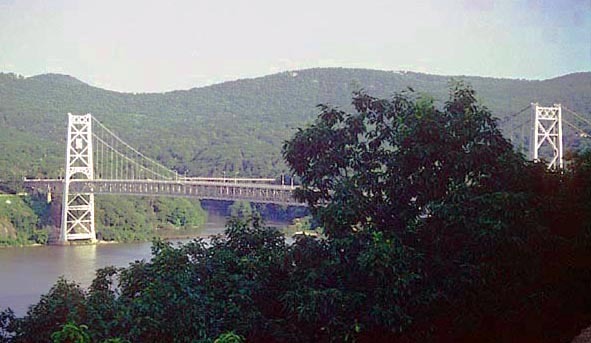 When you get back to Poughkeepsie, take the Mid-Hudson Bridge over the river into Ulster County. Take Routes 9W and then 299 to the historic city of New Paltz. 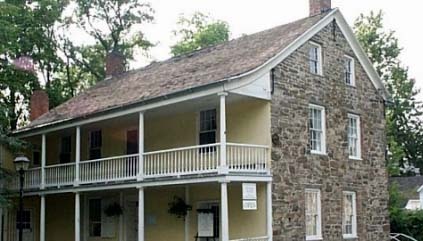 Visit the homes of Huguenot families who have lived here since the 1600s. 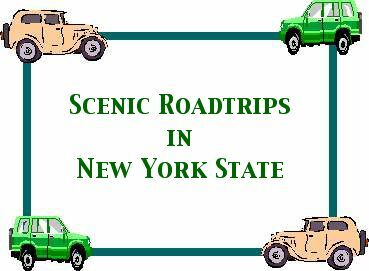 Or, you can take Route 44 west up into the Shawangunks to Minnewaska State Park. The rock formations and the crystal clean lakes are special indeed. Retrace your steps and stay on Route 44 and pick up Route 32 near Modena. Take this road right into Newburgh. This old city was Washington's Headquarters in the American Revolution. This historic site is near the river. While there, visit the shops and cafes of Newburgh Landing. If you take Route 32 out of Newburgh you soon pass another "revolutionary site," New Windsor Cantonment, where the Patriot Army finished out the war. Pick up Rte. 9W southbound, and enter the scenic Hudson Highlands. Detour slightly through quaint Cornwall-on- Hudson and take Rte. 218, the Storm King Highway. Here the road hugs the cliffs over the Hudson, a breath-taking view! 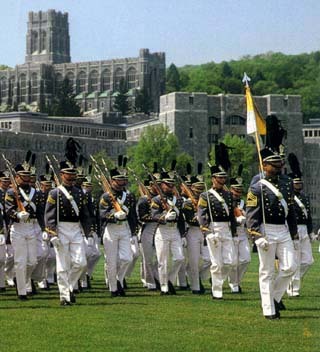 This road will lead you into the U.S. Military Academy at West Point. Go the Visitor Center at the South Gate, and sign up for a tour. Trophy Point. one of the highlights of a tour through the U.S. Military Academy. You pick up Route 9W again and continue south along the Hudson. Visit Bear Mountain State Park, and drive to the top for an incredible view. 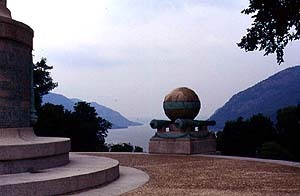 Another scenic highlight is further south, the Palisades Interstate Park, overlooking the wide Tappan Zee. Now you cross the Hudson again, taking I-87 (Thruway). 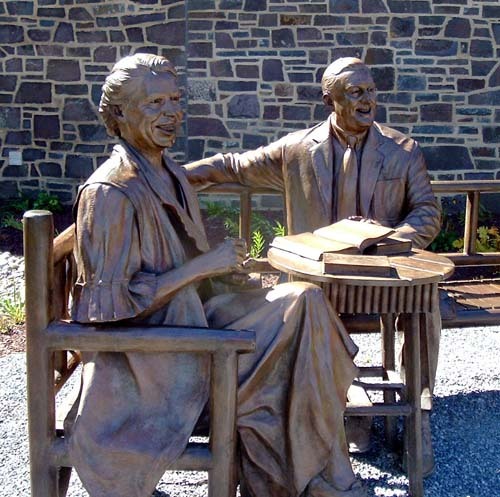 Immediately exit on the east side and visit the old Dutch village of Tarrytown, home to Washington Irving. As you travel northward on Routes 9 and 9D, you pass by several internationally-famous mansions: Philipsburg, Boscobel, Sunnyside, just to name a few. They are all worth visiting. For children, we recommend Philipsburg Manor, since it has an interactive farm community. Peekskill has some very significant sites from the Underground Railroad, such as the John Sands House (pictured on the left). Make sure that you take Rte. 9D, since it follows the river closely. Views of the Hudson Highlands are very spectacular here, especially the Bear Mt. Bridge. In Wappinger Falls you pick up Rte. 9, which returns you to Poughkeepsie.